Lying due north of Australia, New Guinea is among the world’s largest islands. In 1942, when World War II exploded onto its shores, it was an inhospitable, cursorily mapped, disease-ridden land of dense jungle, towering mountain peaks, deep valleys, and fetid swamps. Coveted by the Japanese for its strategic position, New Guinea became the site of one of the South Pacific’s most savage campaigns. 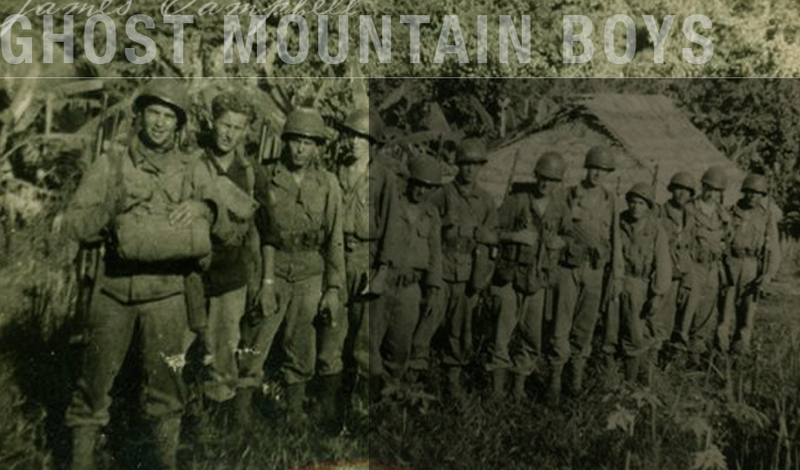 Despite their lack of jungle training, the 32nd Division’s Ghost Mountain Boys were assigned the most grueling mission of the entire Pacific campaign: to march 130 miles over the rugged Owen Stanley Mountains and to protect the right flank of the Australian army as they fought to push the Japanese back to the village of Buna on New Guinea’s north coast. Comprised of National Guardsmen from Michigan and Wisconsin, reserve officers, and draftees from across the country, the 32nd Division lacked more than training—they were without even the basics necessary for survival. The men were not issued the specialized clothing that later became standard issue for soldiers fighting in the South Pacific; they fought in hastily dyed combat fatigues that bled in the intense humidity and left them with festering sores. They waded through brush and vines without the aid of machetes. They did not have insect repellent. Without waterproof containers, their matches were useless and the quinine and vitamin pills they carried, as well as salt and chlorination tablets, crumbled in their pockets. Exhausted and pushed to the brink of human endurance, the Ghost Mountain Boys fell victim to malnutrition and disease. Forty-two days after they set out, they arrived two miles south of Buna, nearly shattered by the experience. The native carriers, who had been such a great help on the jungle trail, now balked. Lutjens understood their fear. Ghost Mountain, he recalled, “was the eeriest place” he’d ever seen. “The trees were covered with green moss half a foot thick. We would walk along a hog’s back, straddling the trail, with a sheer drop of thousands of feet two feet on either side of us. We kept hearing water running somewhere, but we couldn’t find any. We could thrust a stick six feet down through the spungy stuff… without hitting anything real solid. It was ungodly cold. There wasn’t a sign of life. Not a bird. Not a fly. Not a sound. It was the strangest feeling I ever had. If we stopped, we froze. If we moved, we sweated. Private Art Edson, who had scouted the coastal route to Gabagaba with Lutjens, took a moment to write his sweetheart. I take the chance to drop you a line as I may not have the chance again for a long time, as we are no some where in New Guinea… This island is the Hell Hole of the world. I never expected to see natives used for pack horses or dressed like you see in shows, grass skirts and that is all… Have seen quite a few crocodiles and have shot a couple. We shot a snake today, nine feet long. Will write more as soon as possible. The food and water didn’t help the situation. If there was not a nearby stream or river, men drank from muddy jungle puddles. And often when they reached camp, they were so tired they didn’t bother to cook their rice. “We just soaked it in water to soften it and then ground it up in our mouths like animals. It was hell on our bellies,” says Jastrzembski.